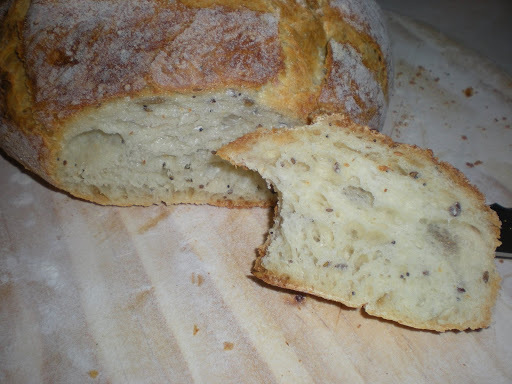 My favorite bread in the whole world is a very simple sourdough white/wheat mix. It’s just starter, flour, water, and salt. 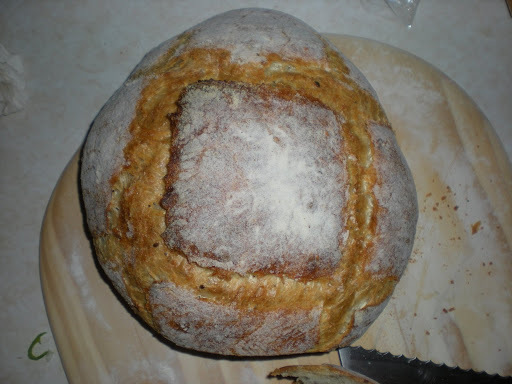 It’s based on Sullivan St.’s no-knead bread recipe, made famous by Mark Bittman of the New York Times. After making it a few times, I’ve tweaked the recipe to use less water. I also added starter instead of commercial instant yeast. 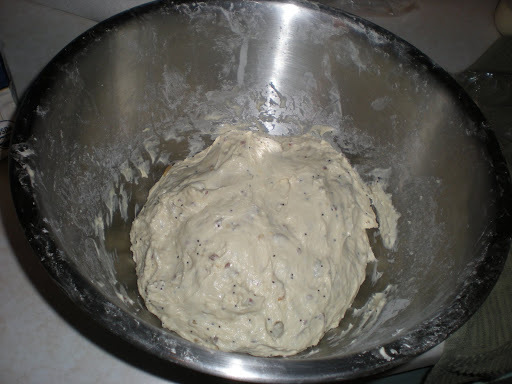 The resulting loaf has a very complex, tangy flavor that makes things interesting. I added some flax seeds in it this time. What’s nice about the recipe is that it is so simple you can really throw in anything you want. Oatmeal, honey, beer, sunflower seeds, you name it. mix together, then cover with plastic wrap and a dish towel. Let rise overnight. After rising, punch down and shape. Put your dutch oven or pizza stone or ceramic tiles into the oven and preheat oven to 500 degrees. Put bread in the oven and turn the heat down to 470. Bake for thirty minutes, then take the dutch oven lid off. Bake 15-20 minutes more until golden brown and crusty looking. Let cool completely before slicing. 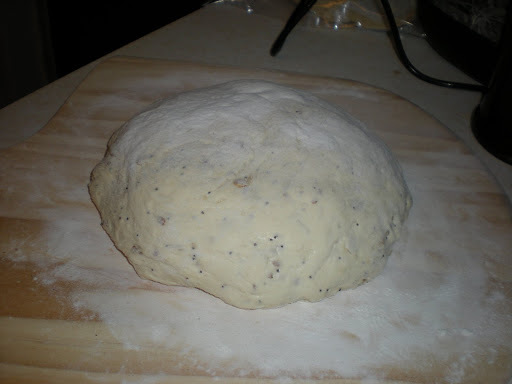 Tonight I started a bread with 6 oz of whole wheat flour and 9 oz of AP. I’ll let you know how that turns out. I’d like to use as much whole wheat as the recipe will comfortably accommodate.